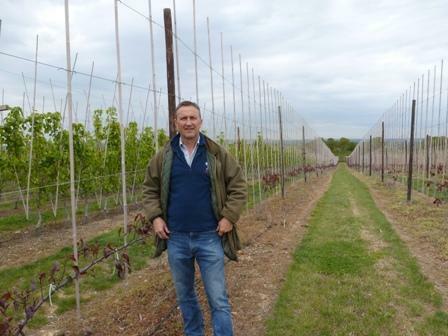 5th May 2017 - How will the mixed weather over the last two weeks influence the potential for this year's crop? 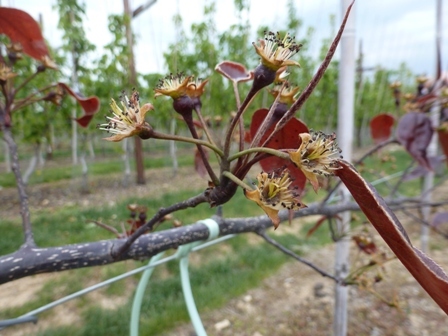 Over the last 2-3 weeks we have experienced above and below average temperatures: the influence on the ability of flowers to pollinate and fertilize changes dramatically with the temperatures - add sporadic air frost damage to orchards and vineyards and it paints an uncertain picture. 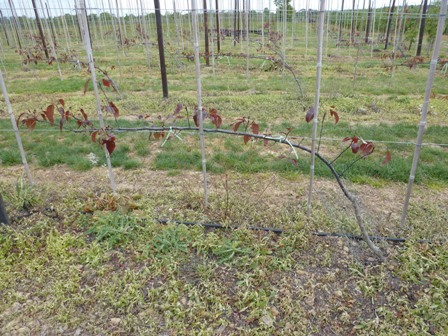 To date the media publicity has been primarily concerned with grapes in UK and Europe.....damage to apples and pears is 'patchy' and my 'eyes in the orchards' tell me while there is frost damage, its early days and he expects the overall crop to be adequate. 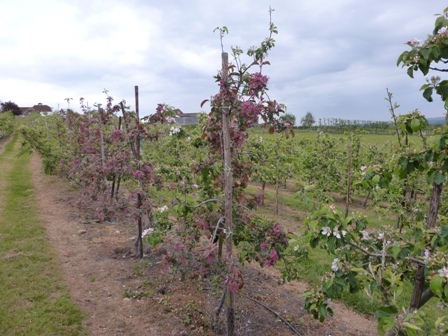 As one grower remarked - "one year I could not find a single flower undamaged by the frost, BUT, still picked a full crop"
Certainly we only need 5-15% of the flowers to 'set' for a full crop.........so its WAIT AND SEE! To achieve pollination and fertilization pollen must be passed from the pollen sacks to the style and grow down the pollen tube as quickly as possible. 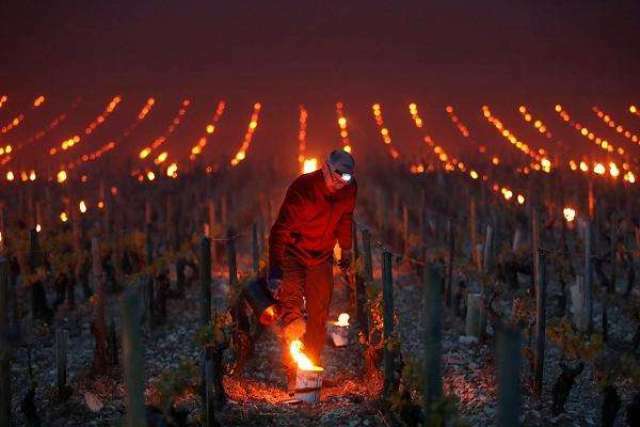 In warm weather this can happen in a matter of hours; in cold conditions it can take days. 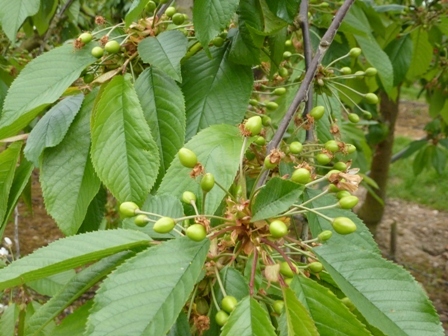 If the pollen does not reach the ovary in time (approx 4 days) it is too late! 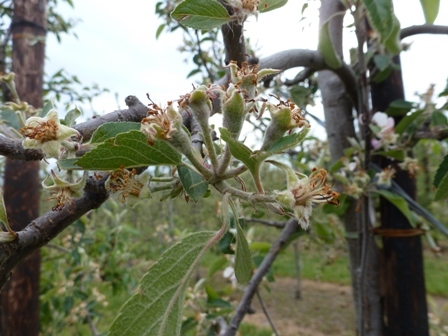 The process is known as the Effective Pollination Period (EPP). 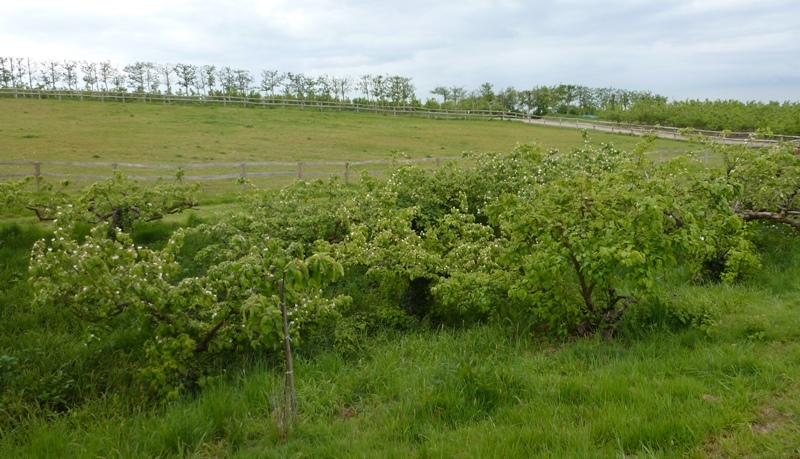 The EPP varies by variety and Cox our national apple has a shorter EPP; no wonder it is difficult to achieve consistent heavy crops. 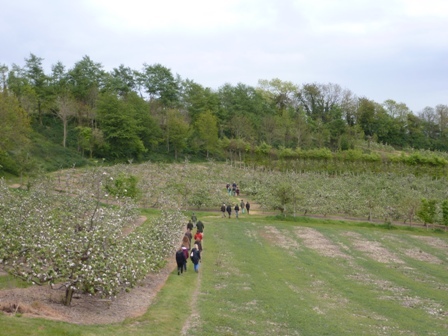 On Tuesday 2nd May The English Apple Man and members of East Kent Fruit Society visited Clive Baxter's Amsbury Farm at Hunton near Maidstone for the annual EKFS blossom walk....the influence of the weather during late winter into spring means the blossom period can vary from mid-April to mid-May. 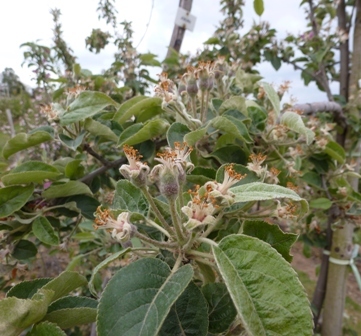 I mentioned in last weeks Journal (7th May 2010) the EPP (Effective Pollination Period) which seems even more poignant now after a prolonged period of low temperatures. 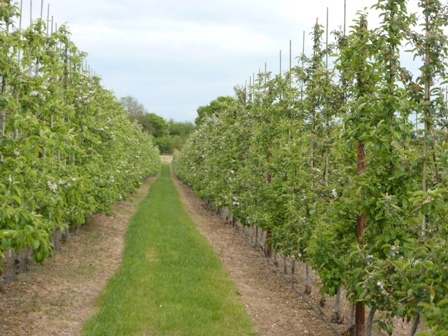 I expect varieties with a propensity to crop; for example Gala and Braeburn are high on that list, but Cox a 'struggler' in cold weather is likely to be well down on last years crop levels. It has been so cold this week that EPP has become less of a conversation piece; but now much more relevant to potential crop yield. My good friend ( and Mentor) Roger Worraker was with me in East Kent on Tuesday and like me (who normally does not feel the cold) found it necessary to 'pile on the layers' to keep warm. As we shivered, we speculated on the impact of this 'bitter' cold. Roger searched the archives for me yesterday and came up with some very poignant research information carried out many years ago. This data 'strikes a note of fear' as an average temperature of 25C will see EPP achieved in 36 hours. 18C requires 65 hours, 10C 6 days and 5C results in NO crop set at all. Since we had day time temperatures of circa 7-10C and night hovering around freezing (or indeed lower) it is unlikely any flowers have set in that period. 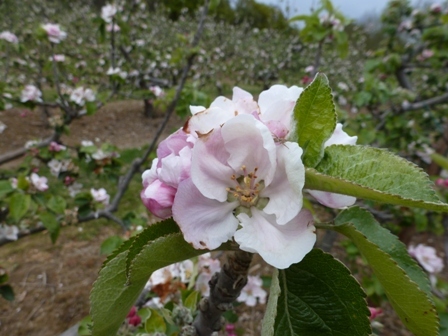 Of course some early flowers and late flowers may well produce more than enough fruit. 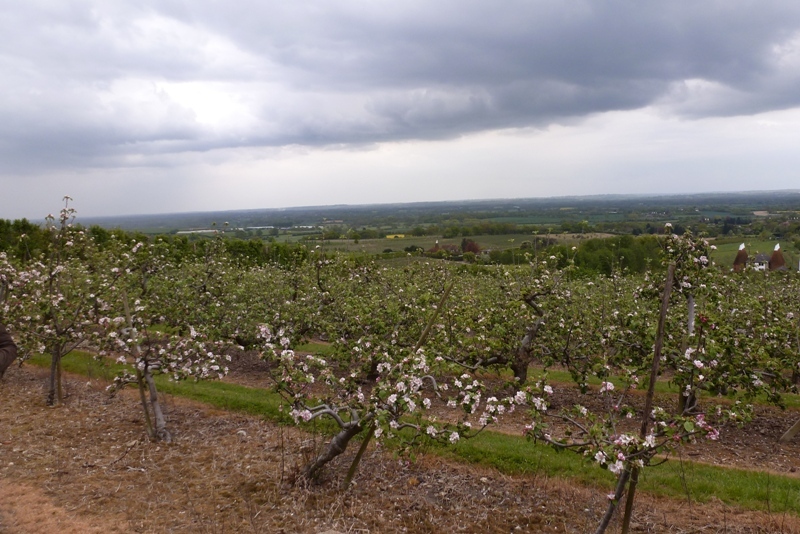 Indeed, this afternoon In an orchard in East Sussex it was warm, the pollen release imbued the air with a wonderful fragrance and the bees were hard at work. 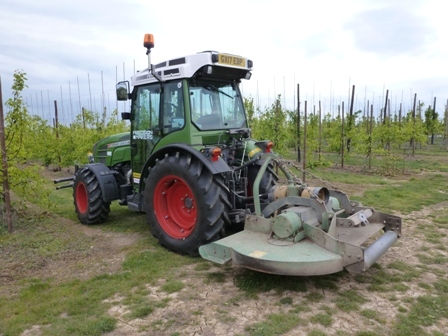 With a warm weekend forecast any late flowers should have more than a sporting chance of pollinating and fertilising rapidly. 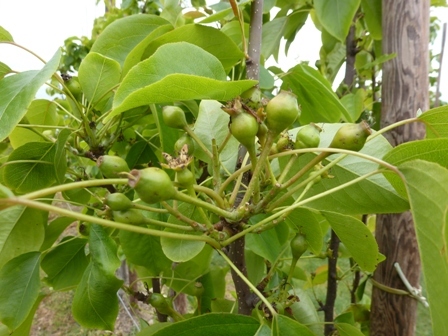 Below: Conference pear fruitlets growing away....but will they stay there? 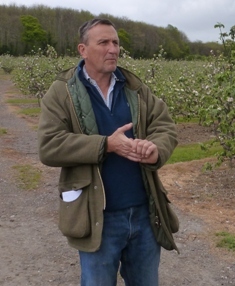 Clive and his family have a long history of growing pears successfully - the pears we saw were planted in 1985 and regularly yield in excess of 30 tonnes per hectare. 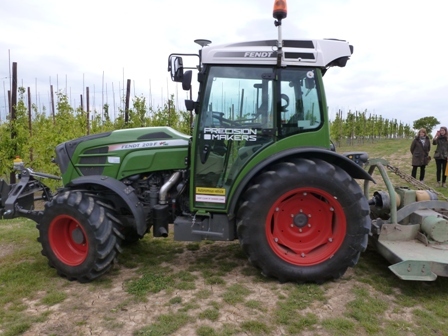 Regular readers of The English Apple Man Journals will be familiar with the driver-less tractor available from Kent based Fendt Agent N.P. 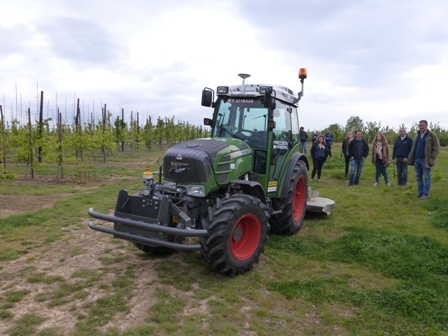 Seymour - now, from a dream of the future, this tractor/driver-less system is now entering commercial use on two farms in Kent. 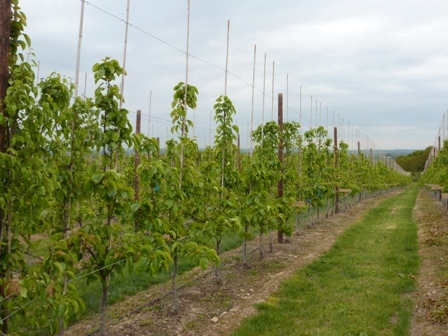 Next on the orchard tour, 4 new pear varieties aligned to Worldwide Fruit Ltd; one QTee is a blush coloured European pear; discovered in Norway - the nearest comparison is the Forelle pear. 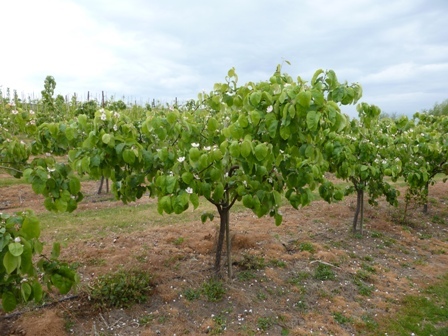 The other three varieties are 'interspecific' pears.....Piqa Boo is the brand name for the cultivar PremP009, which was bred by Plant and Food Research in New Zealand. 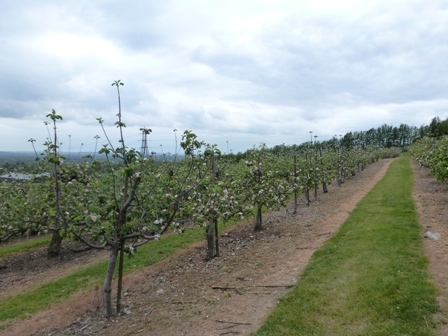 It was bred conventionally, combining traits from both European and Asian pears. 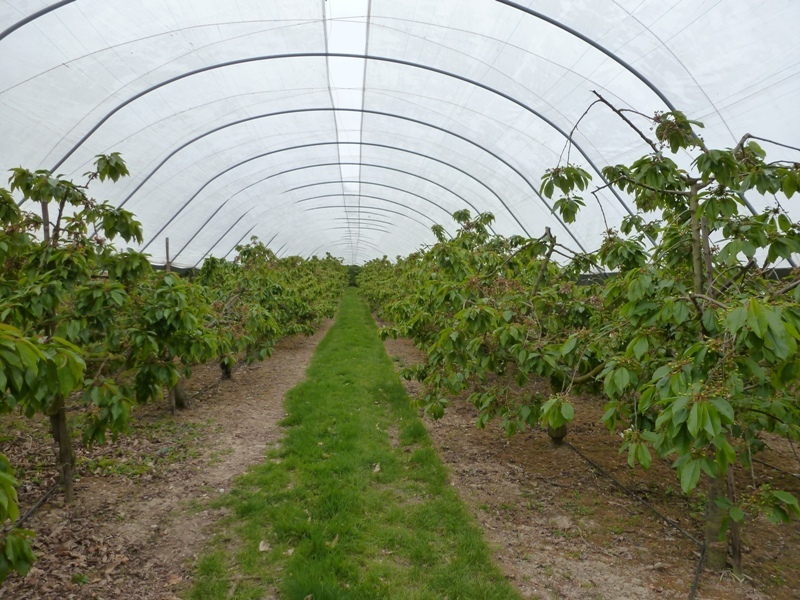 Piqa Boo is the first in what is expected to be a series of Piqa brand interspecific pears. 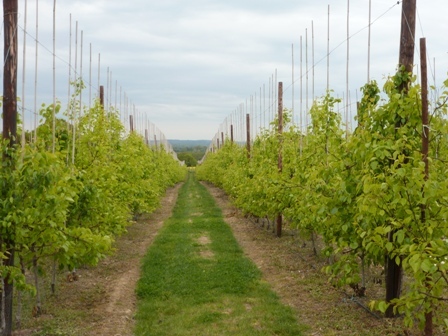 Prevar is licensing the rights to grow, market, and sell these new fruits around the world. 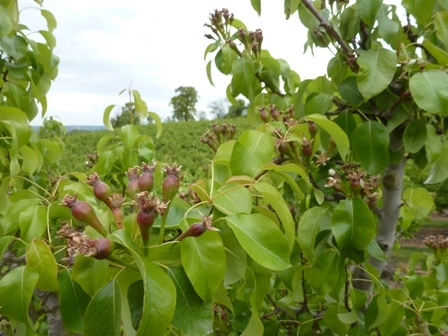 Piqa® brand fruits are conventional hybrids of European, Japanese and Chinese pears. 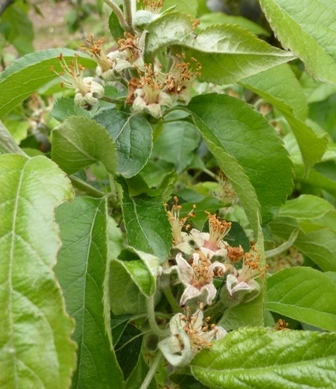 They have interesting and novel flavours, some of which have not been found in pears before including, tropical fruit, tropical pear, melon, coconut and plum as well as recognizable European pear flavours. Acid levels are generally low or are balanced with high sweetness. 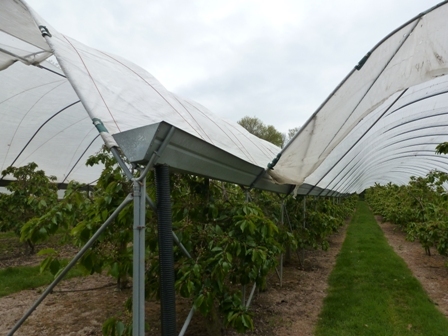 These attributes are often maintained over a long cold air storage and shelf life, for some up to six months followed by three weeks' shelf life respectively. 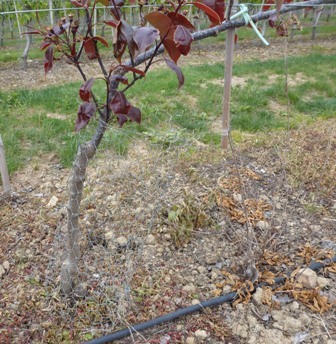 This cultivar is a third generation interspecific pear of complex pedigree. 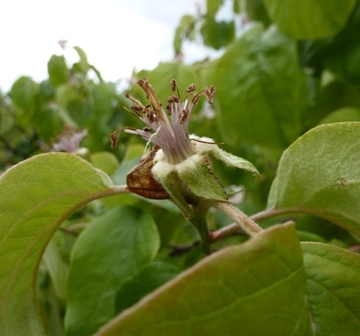 The fruit have a short pyriform shape with a block red colour and small brown lenticels. 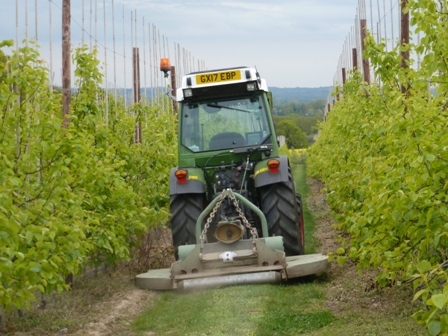 At harvest fruit are crisp and juicy, low acidity, slightly sweet. 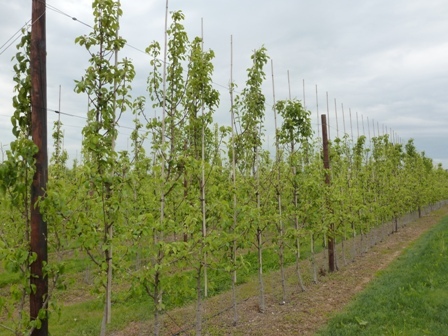 Celina/QTee are like a Forelle in appearance.... Papple was developed in New Zealand as a hybrid of two European and Asian pears. 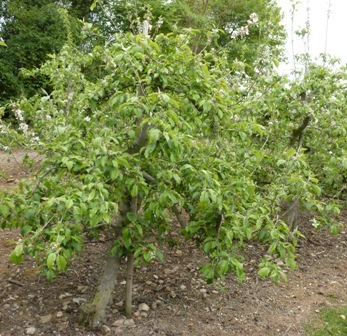 Despite its looks and its name, the Papple isn't related to an apple at all. 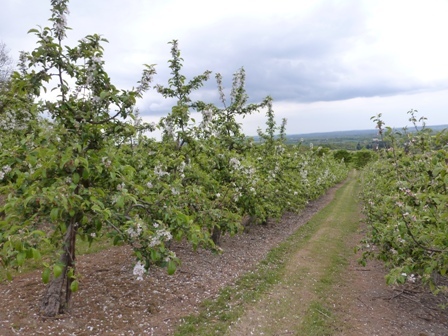 Clive told the EKFS group he has used the Darwin blossom thinner on his 'new pears' and achieved 14 tonnes per hectare in 2015- Clive estimates circa 20 tonnes per hectare in 2017. These new pear varieties are marketed to high profile retailers; M&S and Waitrose.